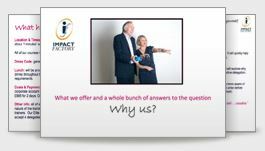 Our training rooms match Impact Factory's style to a T: unexpected, unusual while still being smart and fun to work in. We have intimate rooms for one-to-one work and Presentation courses (lights, camera, action!). There is a larger room for up to 10 people: bright, modern, with plenty of room for our eclectic style of working. We also have two more expansive training rooms for larger groups, creativity work and team building. This is our welcome and break out training area. It is ideal for meeting fellow delegates and holding session breaks. There is always plenty of coffee, tea and chilled water available. Plus we have an endless supply of fresh fruit, biscuits and of course chocolate on tap. This is our main training suite. The unique training room environment with soft lighting and large sofa, comfortably fits 8-10 people. Fitted with flip laptops, internet access, projector and flat screen television, this is ideal for close group working. This mid-sized room, with 54.4m2, is modern and ideal for training and/or meetings. This room can be configured to suit your needs from creative workshops to business meetings. This self-contained room can sit up to 16 people comfortably with access to AV equipment. This is our Large Training Suite with relaxing breakout room, making it ideal for monitored focus groups, team building and large training groups of up to around 20 people. This is an intimate breakout space suitable for both small and one to one work. The room is directly attached to the Red Room for breakout purposes.